Mayanti Langer is a popular name amongst cricket fans over the past few years. She is associated with Star Sports after they bought IPL rights. Star India bought the rights for a record ₹ 16350 crore and are doing their best to engage with fans to encash IPL 2018. She is currently busy with IPL as TV presenter. She has been a hot topic for discussion. It is no secret that she has attracted a lot of interest from the cricket fans with the way she presents her shows to the audience. She recently accepted an invitation from a fan who asked her out for dinner by suggesting that she and her husband will join him for dinner. 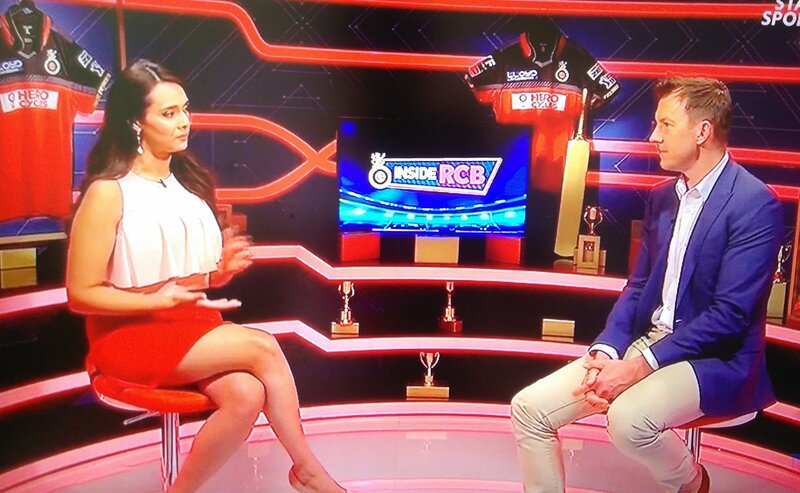 In the ongoing season of IPL-11 fans are enjoying the on-screen chemistry of Mayanti Langer and former Australian Fast bowler Brett Lee. During the match between Rajasthan Royals and Delhi Daredevils, Brett Lee trying to demonstrate a bowling action threw his coat and Mayanti couldn’t help but smile at this. Very soon Mayanti’s smile became viral on internet and her fans couldn’t stop tweeting about her beauty.